Why Should I Go Kayaking in Maine? There are many ways to explore the beautiful coast of Maine. Hiking and biking will give you a view of the landscape, as will exploring the area beaches. However, to get to know our region from the water, we suggest kayaking in Maine. Sea kayaking is an exhilarating way to get out on the water and see the different features that make our home so special. Whether you’re comfortable with a paddle or a total beginner at kayaking, you’ll find the perfect adventure while kayaking in Maine. If you want help finding your way around as you’re kayaking in Maine, check out one of these outfitters. They offer rentals as well as guided kayak tours. So, whether you want to strike out on your own and explore or have an expert guide you around the area to see the sights, these companies have you covered. Harbor Adventures has a variety of kayak tours available as well as instruction. 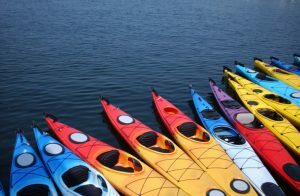 If you’re a complete beginner their Introduction to Sea Kayaking course is the perfect way to get into the swing of things. It goes over the fundamentals of kayaking such as strokes, rescues, safety, and different types of boats and equipment. There is both instructional and practice time included. Their other kayak tours include the Harbor Tour, the 1/2 Day Tour, the Lobster Luncheon, the Sunset Tour, and the Full Moon Paddle. Operating out of Cape Neddick, Excursions offers both tours and instruction. Their half-day Coastal Explorer trip is good for beginners and experienced kayakers. The tour usually covers about three to five miles of coastline with a registered Maine Guide leading the trip. Theses trips are scheduled daily. At Portsmouth Kayak Adventures you can take both kayak and stand up paddleboard (SUP) tours. All tours are lead by professional guides and include basic instruction. During the tour, your guide will point out places of interest as well as biological and historical facts. There is no experience needed to take one of these tours. Wherever you plan to do your kayaking in Maine, be sure you booking your accommodations at Dockside Guest Quarters. Our York bed and breakfast is the ideal place to relax and refresh between activities during your time in Coastal Maine. Our rooms and suites have classic New England style combined with modern comforts and amenities to enhance your stay with us. Plus, there is plenty to do on the waterfront property. You can play croquet, shuffleboard, and badminton. Or you can simply lounge on the lawn and watch the harbor activity or read a book. You’ll find that all of your worries will melt away at Dockside Guest Quarters. Plus, our on-site Restaurant is one of the best dining destinations in the area. An elegant yet comfortable atmosphere awaits diners at our York, ME restaurant. You can expect New England favorites prepared with fresh local ingredients. So, for the best all around Coastal Maine experience, you can’t go wrong with Dockside Guest Quarters! We’ll see you soon!